Mt. 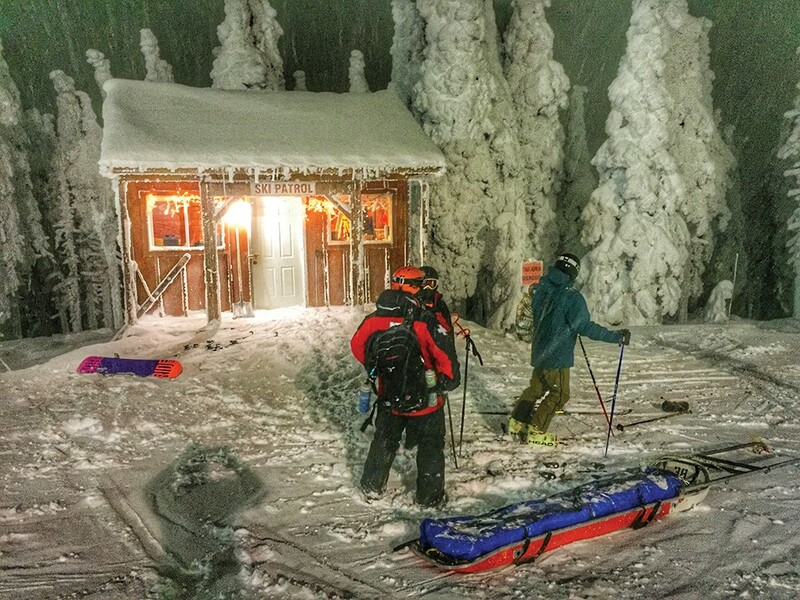 Spokane Ski Patrol members respond to about 250 calls for help on the slopes each year. When Ryan Berk's grandfather first joined the Mt. Spokane Ski Patrol around 1950, rescuers scoured the frozen slopes without the help of cellphones, helicopter support or Gore-Tex. Story has it that Gordon Berk skied his first patrol shift in exchange for a free meal. He would spend the following decades saving stranded powder hounds and training up recruits. In 1969, the National Ski Patrol named him Outstanding Patroller of the season. "They skied on wooden skis with leather boots," Ryan Berk says. "Things have changed, (but) the core mission really hasn't." Following after his grandfather and father, Ryan Berk, 32, grew up on the mountain as a third-generation patroller in one of the nation's largest and oldest all-volunteer ski patrol organizations. Formed shortly after the creation of the National Ski Patrol in 1938, the Mt. Spokane Ski Patrol has kept local recreationists safe for 80 years. This next season may be a big one, as the patrol looks to grow its ranks to cover a new chairlift, additional runs and extra guests. "It's a lot of work," Berk says of the patrol. "You really have to love skiing. You really have to love helping people." Director Randy Foiles, who has spent more than 35 years with the MSSP, says the patrol's 140 volunteers complete weeks of training in ski technique and medical care. All types of people — doctors, sales reps, students and retirees — dedicate their winters to serving on the slopes. Patrollers must clear runs, mitigate safety hazards, search for stray guests and respond to approximately 250 emergency "codes" each year at the Mt. Spokane Ski and Snowboard Park. A medical auxiliary group also staffs the patrol headquarters and nursing station. Over its eight decades of service, patrollers have watched the resort grow, celebrated unlikely rescues and sometimes met their future spouses. They have also seen the lodge burn, combed plane wreckage for survivors and anguished over the people they couldn't save. Foiles says patrol work has become both more demanding and more rewarding in recent years. Certification has become much more sophisticated with the introduction of new medical equipment, performance ski gear and GPS technology. "The training is a lot more intense," he says of the now more than 120-hour certification process. Volunteers also help raise money to pay for all of the patrol's uniforms, radios, medical supplies, rescue toboggans and other equipment. In the mid-1960s, the patrol launched its annual ski swap event to help fund its operations. And in 1992, it opened a new headquarters. "It was a labor of love," says Larry Briney, a patroller for 31 years. "It's like a piece of furniture." The 6,500-square-foot chalet rose out of largely donated materials and thousands of volunteer hours of construction work, with former patrol director Craig Lee serving as structural engineer. It houses medical facilities, dining areas, gear storage and training space. Briney notes guests often mistake the facility for the resort's main lodge. Next spring, the patrol expects to make its largest recruitment effort in years as the Mt. Spokane Ski and Snowboard Park opens a half-dozen new runs on the mountain's northwest side. The controversial expansion will add nearly 80 acres of trail to the patrol's responsibilities. Foiles says they will probably need to bring on 10 new patrol members to cover the extra areas and shifts. The patrol will conduct a day of on-the-hill ski testing and interviews in February. "This is kind of an important recruiting year," he says. While serving on patrol requires great commitment, Foiles says volunteers receive free season passes, access to the patrol building and advanced mountain skills training. After their first year, members also get free passes for family members. But it's the camaraderie, professionalism and satisfaction that keep people dedicated year after year. Foiles says few things feel better than working as a team to save lives. "I'm not doing it for the free pass anymore, that's pretty obvious," he says with a laugh. "My best friends are on the ski patrol. ... It's such a good organization to be involved with." Briney notes that Mt. Spokane mostly serves locals, so the ski patrol gets to watch out for its own community. They spend long nights searching for lost kids in icy weather. They revive old men who suffer heart attacks on the chairlift. And they sometimes respond too late. "There are accidents over the years that you really never forget," he says. "It gets into your soul." Ryan Berk's father Al says he grew up serving as a mock victim for his father's training sessions and the ski patrol became an extended family. They can lean on one another, mourn together and push each other toward that same shared mission passed down through the decades. "Our job is to be there and make sure people get taken care of," Al Berk says. "It's there to serve the public." "Hopefully we'll have a fourth generation here soon," he adds. Ryan Berk's 3-year-old son strapped into skis for the first time last year and loved it.